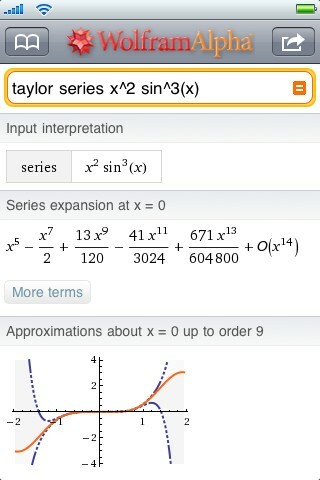 The Wolfram|Alpha iPhone App is live in the App Store. The blogosphere has its own impressions. Argue price, features, business models, and whatever else that seems relevant in those lively communities. On this blog and post I’ll give you my impressions and use cases. Favorites – As with the history, it’s nice to set up your own list of queries you’ll do over and over again. This becomes a sort of “homepage” for me. better GeoLocation – because the Apps can get at lat/long the overall geolocating is stronger than via the geoIP on the website. Refined Keyboard input – when doing a lot of math or long calculations it’s much easier to input queries with a fine-tuned keyboard. Though not a limitation on the full website, the constraints of the default mobile keyboards made using the website challenging on a smart phone. Not so in the app. Direct Links to Source Information – this will go unnoticed by many… but having a hyper linked bibliography with this depth is extremely useful if you need to research deeply or go beyond the calculation. Offline use for very basic calculations when no compute data is accessed. Mashing with Wikipedia and/or other essay style knowledge sources – would be convenient to have backgrounders on some topics and be able to use the Wolfram|Alpha assumption/categorization to do some of the knowledge mining for me. Post your impressions/use cases once you get the app.